Mondesi's House: The Going Rate to Punch a Bengal? $1,000. The Going Rate to Punch a Bengal? $1,000. Snitch spokesman Joey Porter pleaded no contest Wednesday and paid a $1,000 fine for his amateur boxing match with Bengal Levi Jones on March 18th at the Palms Casino. Unofficially, it was the biggest fight held at the Palms this year. The 30-year-old Dolphin did not appear in court, but his lawyer entered the plea to a misdemeanor battery charge. I'm sure the $1,000 will be of little concern to Mr. Peezy, who has 32 million reasons to be happy with the slap on the wrist. Dolphins head coach Cam Cameron issued a statement in Miami crediting Porter with informing the team of the incident. "Joey has been upfront and honest with me since joining our team," Cameron said. "He fully understands the type of character we expect from our players, both on and off the field, and I am confident he will learn from this." Yeah, that's a real stand up guy. He tells you when he's arrested. If he's drunk and three hours late for his own wedding, he somehow will find a way to make it there! His pit bulls may kill a mini pony, but at least he's not breeding them to fight other dogs, like that lowlife Michael Vick. You know what? Cam Cameron is right. 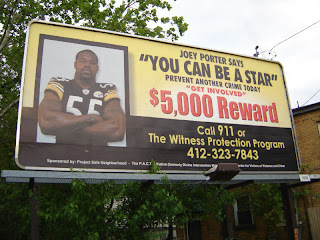 In fact, I think we need more guys like Joey Porter. So I can punch a Bengal for only $1,000? Count me in. yeah... that's only a little more than the cost of the Cowher ice bucket. Too bad Kitna isn't a Bengal anymore. I know some people in my noeck o' the woods (AK) that still want his children to die (seriously. Yikes! ).